This week, I’ve busied myself with pattern writing. I can’t quite share them yet, but soon enough you’ll see my surprises. I’m still reading The Buried Book. I still know I’m a nerd. I’m okay with that. 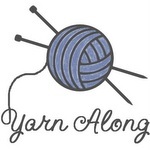 Join the yarn along! Pretty yarn colors. I was thinking those were dishcloths too. I love the color of the yarn. Dishcloths perhaps?? ?